forum.419eater.com :: View topic - Chewy Fruit? We can't have kids if this is how she sees fruity goodness! 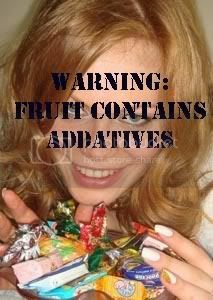 I am sure there is fruit flavouring in those lollies. Tell her you are a diabetic and very offended that she would show you a bowl of fruit like that.